When it comes to weight loss you may have wondered how often to exercise. Do you have to work out every single day, or should you allow a day or two of rest in between? And does it differ when you’re doing cardio workouts or weight training workouts? Do you have any injuries or limitations? What kind of exercise do you want to do? The recommended minimum amount of exercise per day according to NHI is 150 minutes of moderate exercise per week or 75 minute of vigorous exercise per week. Or a combination of the two. One hundred and fifty minutes works out to two hours and thirty minutes a week. So, technically, you could break that down into seven 21-minute sessions of moderate exercise, and do that every day. But when it comes to exercise, variety is the key. And you might want to work out longer on some days, and not so much on other days. 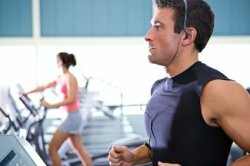 How Often Should Beginners Exercise? Depending on your personal fitness goals, how often you should exercise will vary. But it’s important to work your way UP to the minimum amount of 150 minutes of moderate exercise per week.. Exercising too hard or too often can cause injuries. And if you overdo it, the soreness you feel may make you swear off exercise all together! Write down how much exercise you get now each day. Even if it’s walking. Walking *is* exercise, too. Decide on what type of exercise you’re going to do Will you be doing cardio? Weight training? A combination? Check out the minimum for cardio and weight training down below. What’s the minimum of that you can do each week? Create a workout plan. It could be something as simple as walk around the block each day. Pro Tip: Start off with exercises that you love to do! How Often Should You Do Weight Training? Most experts say that weight training should not be done every day because resistance exercises that stress your muscles actually create small tears in the muscle fibers, and the muscles then need 24-48 hours to heal and repair themselves. Aim for 2 to 3 strength training sessions per week, lifting weights heavy enough to fatigue the muscles (or a few reps before). Beginners can start with one set of 8 to 10 exercises that covers all the muscle groups. Don’t have any weights? You can do body weight exercises such as pushups, squats or tricep dips. Cardio workouts get your heart pumping and can be done 3 to 5 times a week, for 20 to 60 minute sessions. Brisk walking, swimming, low-impact aerobics, using an elliptical machine or moderate paced bicycle riding shouldn’t strain your muscles too much and they can help you burn more calories and aid in weight loss. How Often Should You Do Stretching Exercises? It seems everybody forgets about stretching, yet it’s an important part of any exercise program. Stretch at least 2 to 3 times a week minimum and up to 5 to 7 times a week, ideally. Stretch all muscle groups for 15 to 30 seconds per rep. The ideal time to stretch is right after a cardio workout. Should You Exercise Every Day? Yes, you should be doing some kind of activity every day. You don’t want to sit or lie down all day, right? Mix up the type of exercise you’re doing so that you’re not doing the same type on consecutive days. But give yourself at least one full day off from any kind of official exercise routines. A day off from working out is a great way to not only allow some well-deserved rest for your body, but also to help you relax mentally and emotionally. On your day off, you can still engage in physical activities, but try to keep them “unofficial” - activities like window shopping, playing with the kids in the backyard or taking a relaxing stroll on the beach are great ways to relax, recharge and restore your physical and mental energy. No matter how often you exercise, you need to listen to your body because there is such a thing as overtraining. How Long Should You Work Out? The duration of your work out depends on you and what kind of workout you’re doing. In a way, it’s not the amount of time; it’s what you do with that time. If you spend 60 minutes weight training but half of that is spent talking with other people or you’re not working out very hard, then it’s not really a 60 minute workout, right? The only way you’ll know how long your workout should be is to start working out. If you’re a beginner, keep your workouts short. Once you get an idea of what you can do, you can increase the duration of your workouts. For example, if you don’t walk a lot, maybe a 15 minute cardio workout will be good for you. Jump in, get a feel for things and then make adjustments.